"If you could just change your way of thinking, everything'd be different, you know?" Random comment from a fellow passenger seated behind me on my flight from Brisbane to Sydney this morning, standing out in its profundity from the rest of her chatter about the celebrities and boots in the inflight magazine. She and her girlfriend were anxious fliers, poor things, and both takeoff and landing were accompanied by a low chorus of profanities, perhaps encouraged by the Jim Beams they were necking in the departure lounge beforehand. This trip has been my first experience of Virgin Australia, and it's been pleasant, though there were a couple of surprises: there's no plug-in entertainment at all, not even the dreaded Easy Listening. You can use your wifi-enabled devices to get music and movies, but only if you've previously installed the app, I discovered once we were in the air. And then there was the unexpected comment in the safety briefing about passengers possibly being asked to help with the life rafts. Life RAFTS? Is this a new thing, or have I missed it entirely in all these years of flying over the world's oceans? 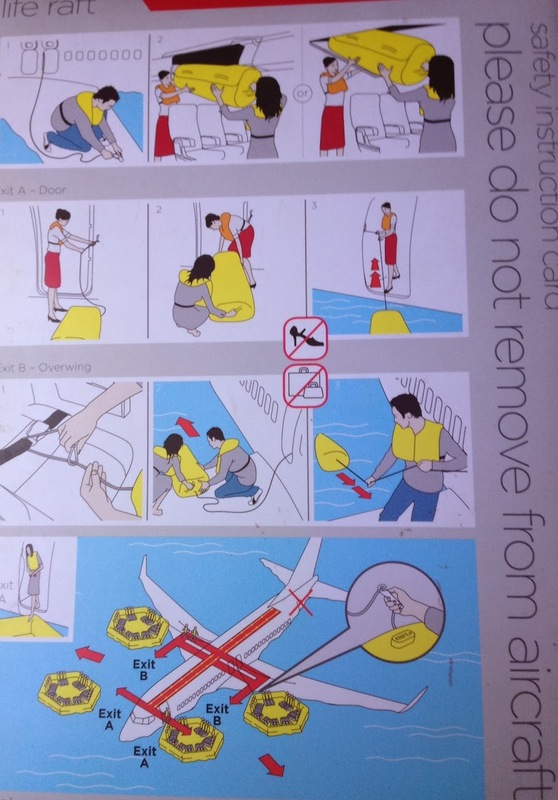 Life jackets, sure, whistle, blow-up tube, inflate after exiting, yes. But actual rafts? Clearly desirable, especially in the vicinity of sharks - though I wouldn't be keen to be shoulder-tapped to help the flight crew heave the rafts out of the overhead lockers, drag them along the aisle and push them out of the emergency exits. Especially if there wasn't a flat calm out there, and broad daylight. Hmmm. There was no danger of their deployment today though, with our route 95% over land, much of it obscured by bushfire smoke. Perhaps asbestos suits might be generally more useful? But otherwise, no complaints: cheerful crew, punctual, comfortable enough and efficient - with the added bonus of deep thoughts from the seat behind. Stinging riposte? No, stinger post. Earn yourself some feel-good points: right here!